A gluten free snack that tastes delicious! 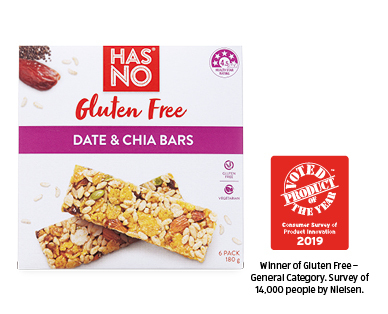 Made with quality ingredients this product provides a wholesome and satisfying snack for those excluding gluten from their diet. Proudly made in Australia, the range contains no artificial colours, flavours or preservatives. Also available White Choc, Almond & Raspberry Nut Bars or Salted Caramel Bars. Winner - Gluten Free General Category.